LinkedIn InMail messages have been getting a lot of airtime recently. 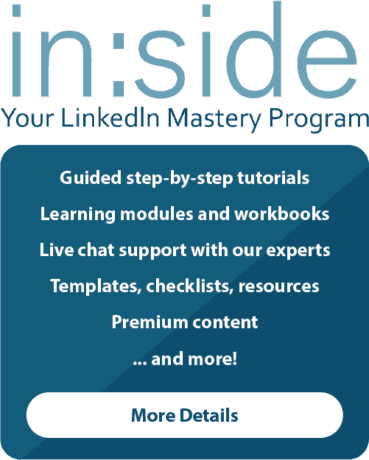 From webinars to ebooks to A TON of client questions, it seems that this LinkedIn resource that helps you directly message non-connections is simultaneously appealing and intimidating. But have no fear! I send InMails all of the time, (daily as a matter of fact), and I’d like to share some pointers with you. With nearly 5 years of experience in reaching out to candidates on LinkedIn, I’ve honed my InMail messaging quite a bit over the years. I also often get feedback from candidates that they’ve received other messages from recruiters on LinkedIn that they never responded to, but that my message was different. It is always wonderful to hear this feedback! I am not sharing this information to brag. I just want to reassure you that you’re in good hands, and I think these tips will help you send great conversation starters on LinkedIn. My first note on InMails is an important one to consider. I sometimes see our clients put a lot of weight into their InMails, as if this one message is going to make or break their entire campaign. But it’s important to remember that this message’s primary purpose is to start a conversation. Nothing more. You’re not going to close business by sending one InMail message. You’re not going to fill a position after a brief exchange of messages on LinkedIn. You will need to put in the hard work on the phone or in person. This message should really just create some interest and encourage connection. So stop, breathe deeply and carefully consider things through this lens. It will help you quite a bit. What Kind of Message Do You Want to Receive? What kind of message would you be happy to receive on LinkedIn? This is my primary piece of advice, and it really takes a lot of the mystery and anxiety out of the process, doesn’t it? You want to, above all else, consider what kind of language, phrasing and details would actually make you pause, consider and reply if you received a message from a stranger on LinkedIn. It may seem too simple, but often people type a message that focuses too much on their goal and it arrives feeling rigid, stuffy and uninteresting. In January, I began each InMail I sent with “Happy 2019!” It subtly communicated that this was not a message template that I created months ago, and that I’m a friendly person. Many people replied with “Happy New Year to you too!” It was just a nice exchange. Of course all of this means that you have to take the time to read the profiles. If you really want to illicit a response, you are going to need to earn that response. There aren’t many shortcuts around that. You’ve now geared your wording toward normal human speak and not marketing robot speak AND you’ve opened your message with something about the recipient. You’re now ready to include some detail about why you’re reaching out. It is in your best interest to say it as concisely as possible. 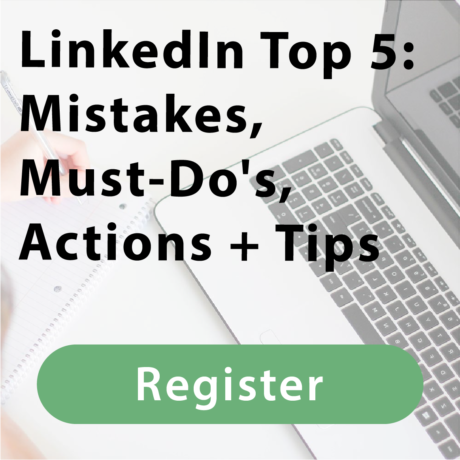 #1 – Long messages do not get read on LinkedIn. #2 – Many individuals check their messages from their mobile devices. They don’t want to read paragraphs. #3 – Remember, your InMail is only meant to start a conversation, and then to be resumed on the phone, at a Starbucks, or in the office. This InMail does not need to sell your product or service outright. LinkedIn allows space for 1900 characters in an InMail message, but that’s entirely too long. My rule of thumb has been to keep my messages as close to 600 characters as possible. It’s a good length. You can read 600 characters quickly and easily without feeling like someone is wasting your time. You can count characters by drafting your messages in a Word document first. You should be doing this anyway. It’s best to draft your messages thoughtfully and with intention, as opposed to just “riffing” in the moment. And that’s really what it’s all about, isn’t it? A careful plan and the right intentions. Sales people – sell your hearts out! 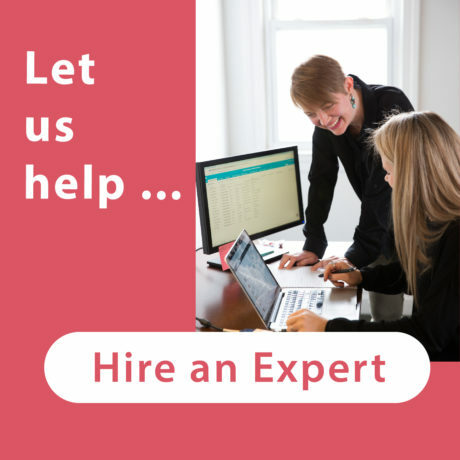 Recruiters – find all of the talent! Just make sure it’s genuine and coming from a place of providing value as opposed to making this InMail just another drop in the bucket. 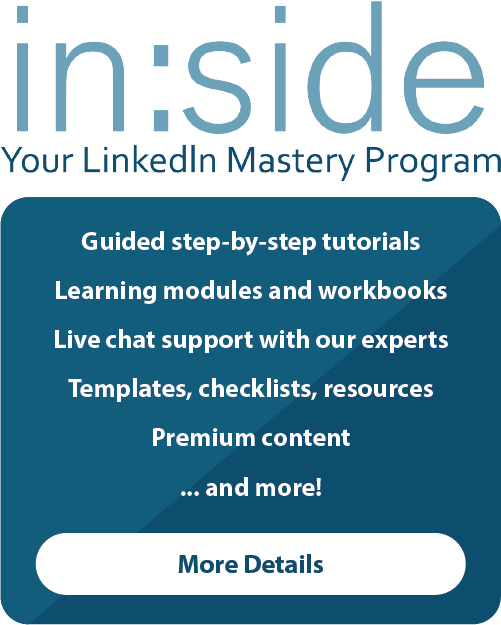 If you’re looking for additional ways to strengthen your network and use those connections to strategically build your practice, we’ve created in:side, Your LinkedIn Mastery Program. It’s designed to give you what you need to master LinkedIn once and for all. Please take a look and reach out with any questions.